New Plants For My Garden! It’s a great time of year to work in a garden center. Summer bulbs and bare-root plants fill the racks in the store while the trucks roll into the nursery outside. 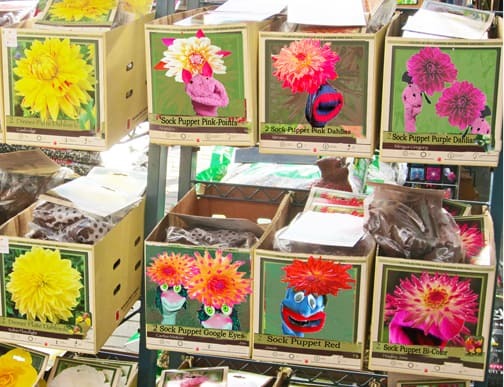 Today I was thrilled to see that the new line of Sock Puppet Dahlias was in! This is a new variety made possible through a blend of tissue culture and gene splicing, and I can hardly wait to try them in my garden. Puppets have a long history in Central and South America, from CIA sponsored puppet dictatorships to the stick figurines that the Teotihauacan culture of Central Mexico used in funerary rights. Since Dahlias are herbaceous perennials native to Central America, Mexico and Columbia, it was only a matter of time and science for these two colorful traditions to be combined. How wonderful it must have been when the dahlia breeders finally made the break though that allowed puppet-formed stems to be genetically fully compatible with the flowers. Although I know that those who resist Genetically Modified Organisms will undoubtedly be opposed to this new cultivar, I can’t help but think that somewhere in heaven, Jim Henson is smiling. This thought alone is reason enough for me to plant them. You'll want to grow Sock Puppet Dahlias in plenty of sun. Fertilize weekly in order to make stems stretchy enough to fit over adult hands.